Setting and achieving goals for ourselves is important. I would even say it's vital… especially when it comes to money. It is possible to get things you want without going into debt, and SmartyPig is proof of that. Let me share with you this SmartyPig Review, in hopes you realize just how amazing it is! SmartyPig is a type of ‘micro savings' program that helps you set and achieve savings goals. In fact, their members have saved upwards of $5 billion. And these are just normal people taking their savings goals seriously. You can too, and it's completely free. What is a SmartyPig Account? It is an online goal-oriented savings account designed to make it easy for you to set and achieve savings goals. They refer to it as an “online piggybank”. What's really cool is that you can have as many piggy banks as you want. They take a second to set up and it's all free! How is it different from a Savings Account at a Traditional Bank? With a traditional bank, if you wanted to set different savings goals, you'd have to open up multiple accounts and manage everything. And then there's the hassle of opening up accounts in the first place. Beyond that, many savings accounts have high balance minimums, requirements, and embarrassingly low-interest rates. Not too bad! Additionally, SmartyPig is not a bank in the sense that they hold your money. They help you save while it is held by Sallie Mae Bank and is FDIC-insured. You will need a traditional Savings and/or checking account as the funding account for your SmartyPig accounts. Or, you can set up a portion of your paycheck direct deposit into it. They will calculate how much you will need to deposit regularly to meet your goal, but this is just a suggestion. Determine an automatic transfer amount, or manually add funds as you want. The automatic transfer option is great because you can build it right into your budget, and it will take the sting and hassle out of manually transferring it all the time. Once your goal is reached, transfer the funds to your checking account and pay for them with CASH! If there is some left over, move it to another one of your goals, or leave it for next year's vacation or Christmas. 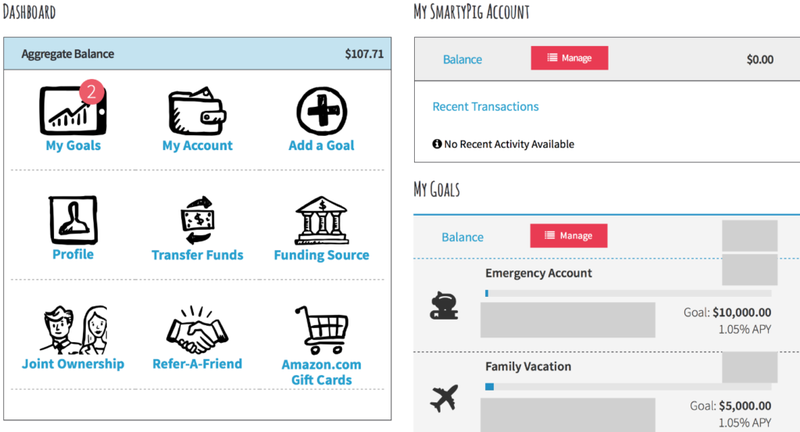 Instead of transferring your goal money to your checking account, currently, you can use it to purchase an Amazon.com gift card through Smarty Pig. This is convenient if you are a big Amazon shopper, especially if you are saving towards holiday gifts or prefer to shop online. For every friend that you refer to Smarty Pig using your unique link, you earn $10! When a friend opens an account and deposits $25 into that account, you earn $10! YES. It is completely free! That includes: setting up an account, creating an unlimited amount of savings goals, and any withdrawals. All free. But, like with any savings account, there are some withdrawal limitations imposed by the federal government. Can I Spend Money Directly from these accounts? No. They are not designed that way. That's not their purpose. I think it's better this way. 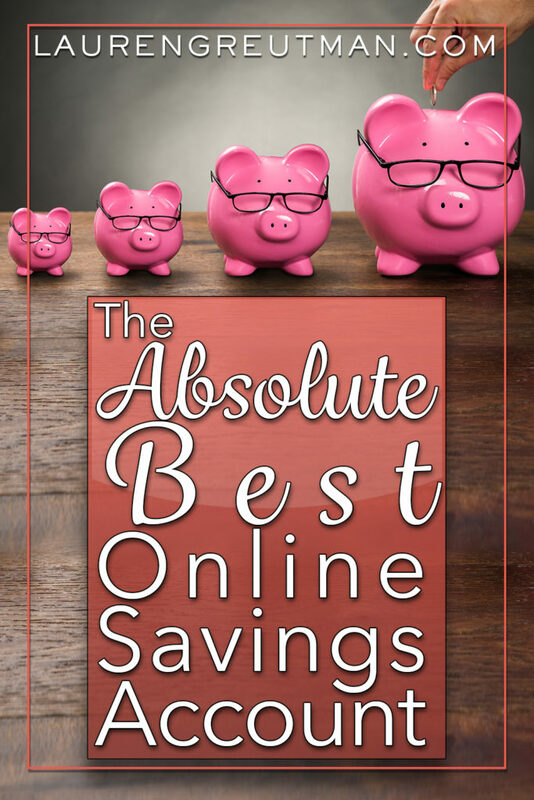 They are strictly an interest-bearing way to help you save for your financial goals. Once the goals are reached, just move the money back into your checking account. Again, signing up is free, and it doesn't take long at all. 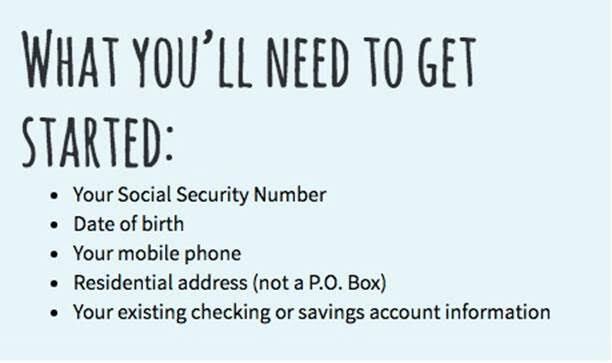 In addition to these items, you'll need a state-issued ID. Beyond that, they will verify your account by making a couple small deposits and an equal withdrawal from your checking or savings account. 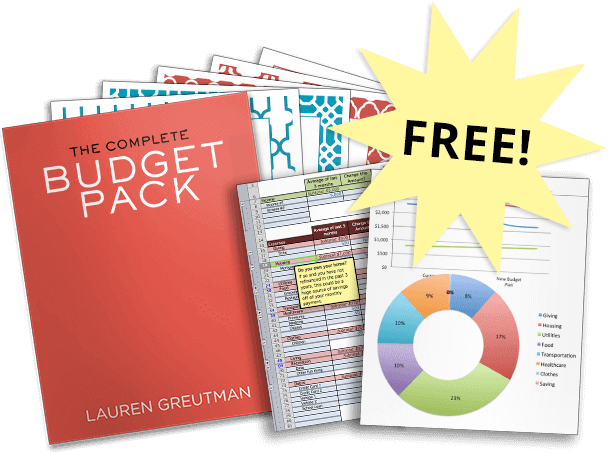 Is there something you have been wanting to save up for? Something you should be saving up for (like your emergency fund)? Or something you need to be saving up for? Please note that I was compensated by Sallie Mae for the content in this post. However, all opinions expressed below are my own, based on my personal experience with Sallie Mae. Any requests for personal information are not associated with Sallie Mae, nor will any information collected be used or maintained by Sallie Mae. Advertised Interest Rates and Annual Percentage Yields (APY) for the SmartyPig Account are variable and may change after account opening, are based on your account balance, apply to personal accounts only, and are accurate as of 07/12/2017. The ongoing APYs and Interest Rates associated with different account balances are: If your daily balance is more than $0 but $2,500 or less the interest rate paid on the entire balance in your account will be 1.04% with an annual percentage yield of 1.05%. If your daily balance is more than $2,500 but $10,000 or less the interest rate paid on the entire balance in your account will be 1.04% with an annual percentage yield of 1.05%. If your daily balance is more than $10,000 but $50,000 or less the interest rate paid on the entire balance in your account will be 1.14% with an annual percentage yield of 1.15%. If your daily balance is more than $50,000 the interest rate paid on the entire balance in your account will be 1.14% with an annual percentage yield of 1.15%. Please refer to the SmartyPig Account Terms and Conditions Agreement for details. Your SmartyPig Primary Account must be open for 60 calendar days before you will be able to order an Amazon.com Gift Card using your SmartyPig funds. Upon ordering an Amazon.com Gift Card, you will be required to read and agree to the Amazon.com terms and conditions pertaining to the gift card. Amazon.com Gift Cards can be purchased in amounts from $5 to $500. Amazon.com Gift Cards cannot be redeemed for cash. SmartyPig and Sallie Mae Bank are not responsible for lost or stolen Amazon.com Gift Cards, and no exchanges or refunds will be given by SmartyPig or Sallie Mae Bank for unused Amazon.com Gift Cards. Any disputes following the purchase of a gift card will need to be discussed with Amazon and will not be the responsibility of SmartyPig or Sallie Mae Bank following the purchase. Funds are no longer FDIC-insured once placed on an Amazon.com Gift Card. Sallie Mae reserves the right to change or terminate the Amazon.com Gift Card program at any time without notice. The terms and conditions of this program are subject to change at any time.